The year is about to end and I’ve started listing down the things I’ve accomplished and learned. It will be one long list but I can now tell you that the year 2012 made me realize that parenting and disciplining your child isn’t as easy. Taking care of your kid is very much different from raising him up. I, together with my husband, have finally faced the challenge of disciplining our 3-year old Noah. I realized I cannot just rely on what I know or learned from our parents because everything is different now. All I know is, I still need to hold on to God and trust Him that I can become the kind of mother He wants me to be. By Grace. I started My Mommy Notebook and shared with you a few tips and my reflections on Disciplining Children with Love. It’s been a challenging year because my Noah is one hyper active kid. Josh and I both work from home and while others think it’s one amazing setup, it has its advantages and disadvantages. To learn more about parenting, we read books. Husband and I read a book separately and then we meet over breakfast or lunch to talk about what we just read. I have my Moms devotional book that I so treasure. There’s the Bible to read and remind me. Oh the nuggets of wisdom you can find in this book are just too many–all helpful! 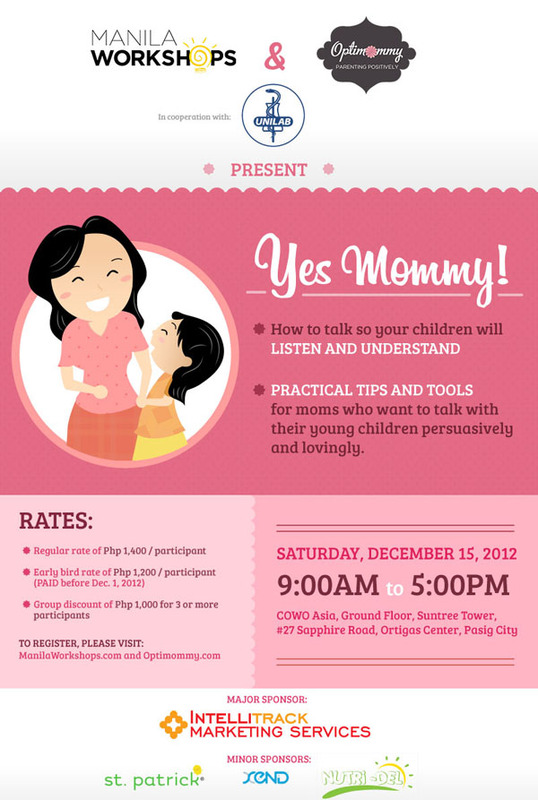 And next week, I’m going to attend a seminar on intentional parenting: the Yes Mommy: How to Talk so Your Child will Listen and Understand Workshop. Reading will not be enough and it’s interesting to meet other women who are in this same journey. UPDATE: Good news! You can join the workshop with a 50% discount on the workshop fee. Just type in OptimommyREAH on the discount code section when you register. See yah!